50 mg Methandienonum per ml. Methandienone is indicated for treatment of severe cachexia resulting from AIDS, severe illness or unexplained medical reasons. Alphabol may also be indicated for treatment of hereditary angioedema. Hypersensitivity to the drug, prostate cancer, breast cancer in men, breast carcinoma in women with hypercalcemia, CPI, severe atherosclerosis, hepatic and renal function, acute and chronic prostatitis, pregnancy and lactation. The recommended dose for injectable methandienone is 50-70 mg a day. It is recommended to individual the dose according to the specific system. 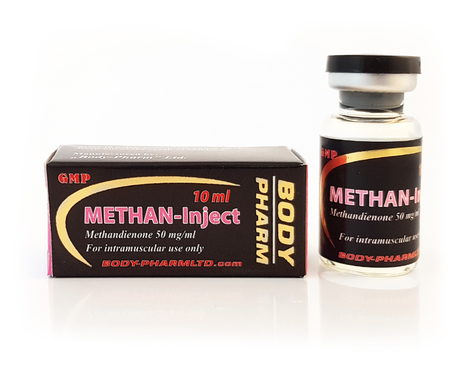 Methandienone is an anabolic steroid. Reaching into the cell nucleus, stimulates the genetic apparatus of the cell, leading to increased synthesis of DNA, RNA and structural proteins, activates the enzymes of tissue respiration chain and enhancing tissue respiration, oxidative phosphorylation, ATP synthesis and intracellular aggregation macroergic . Stimulates anabolic and inhibits catabolic processes those caused by glucocorticoids. Leads to increased muscle mass, reduce fat deposits, improves trophic tissues, promotes calcium deposits in the bones, retain nitrogen, phosphorus, sulfur, potassium, sodium and water in the body. The action is the enhancement of hematopoietic erythropoietin synthesis. Women should not use methandienone because considerable virilization symptoms can occur. Although methandienone has many potential side effects. Methandienone causes a considerable strain on the liver and high dosages or use of over a longer period of time, is liver-toxic. Even a dosage of only 10 mg./day can increase the liver values but after discontinuation of the drug, however, the values return to normal. While using methandienone high blood pressure and a faster heartbeat can occur which may require the intake of an antihypertensive drug. Additive intake of Nolvadex and Proviron may be necessary as well, since methandienone strongly converts into estrogens. Methandienone can trigger a serious acne vulgaris on the face, neck, chest, back, and shoulders since the sebaceous gland function is stimulated. If a hereditary predisposition exists, methandienone can also accelerate a possible hair loss. If overdose of methandienone is suspected, contact your Doctor immediately.